One of my main reasons for doing 23andMe testing was to figure out if I was genetically susceptible to celiac disease. I went gluten-free about five years ago and have felt so much better that I didn’t want to go back to eating gluten in order to get the testing done for celiac. You see, the ‘Catch-22’ of getting diagnosed for celiac disease is that you have to be eating gluten for a while before getting tested. So I was hoping that the genetic testing would rule out the possibility of celiac for me (and my family). Celiac disease (spelled coeliac in Britain) is an autoimmune disorder in which gluten causes damage to the villi in the small intestines. Gluten is a protein found in wheat, barley, rye, and spelt. There are many resources on the internet with great information about celiac disease and the symptoms involved. Celiac.org is a good starting point for anyone wanting to learn more. There isn’t one specific genetic variant that causes everyone who carries it to get celiac disease. Instead, there are genetic variants that must be present in order for a person to be susceptible to celiac disease. So if the variant isn’t present, you can nearly always rule out the disease. With only about 1% of the population having celiac disease, you can see that just having the HLA type doesn’t mean that you will get celiac disease. So looking at your genetic variants could help you rule out celiac disease, but not tell you if you have it. So what is an HLA serotype? Serotypes, discovered in 1933 by Rebecca Lancefield, are variations within species (bacteria and viruses) or variations among immune cells in people. The typing is based on their cell surface antigens. In humans, the human leukocyte antigen (HLA) determines the serotype; the HLA serotype is sometimes used in determining transplant matches. One HLA type is HLA-DQ, which is a protein found on antigen presenting cells. DQ is involved in the immune system through stimulating T-cells, which then signal B-cells to produce antibodies. The HLA-DQ recognizes foreign antigens from pathogens, but it also recognizes common self-antigens. This is where the problem begins when the HLA-DQ loses it tolerance to self-proteins, triggering autoimmune diseases such as celiac, lupus, and type 1 diabetes. Approximately 90-95% of celiac patients have HLA-DQ2.5, which can be determined by looking at rs2187668 (T). [ref] This genetic variant is fairly common and found in about 25% of European Caucasians. 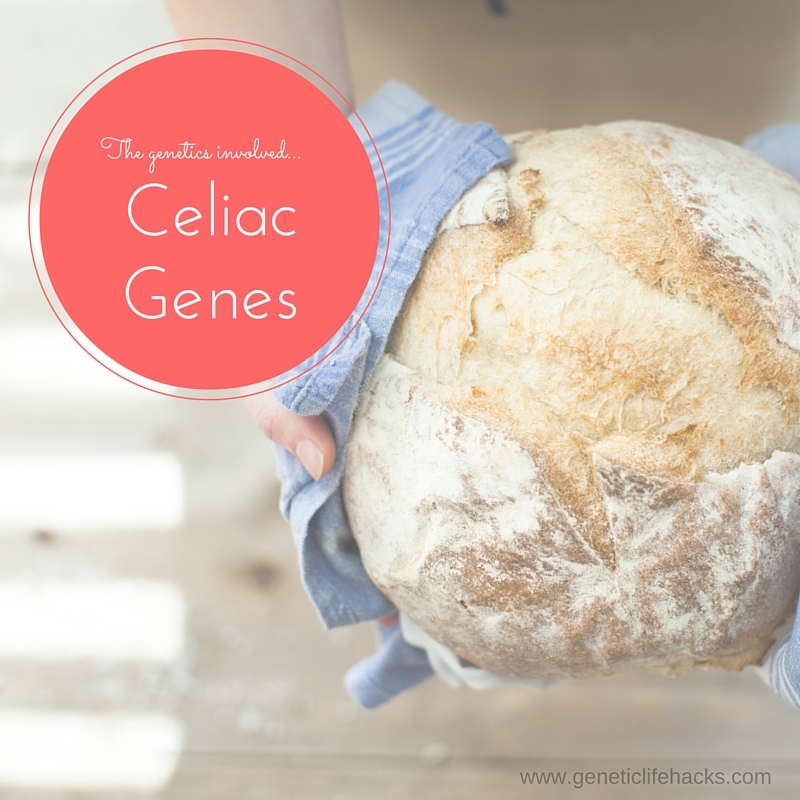 So, again, having the genetic variant does not mean that you have celiac, only that it is possible for you to have it or develop it at some point. HLA-DQ8 alone is found in about 5-10% percentage of Celiac patients. The SNPs above cover most people with Celiac, but not quite all. The HLA-DQ2.2 variant, found by itself in a very small percentage of celiac cases, can not be completely determined with the current version of 23andMe data. Since about 1% of those with European ancestry receive a diagnosis of celiac while 30% have the HLA types for it, something else must also be involved in a person’s risk for celiac. Recent studies have looked into other genetic traits, as well as environmental aspects such as duration of breastfeeding, the timing of the introduction of wheat to an infant’s diet, and types of bacteria in the gut. Below are a few of the current studies on genetic variants that add to the risk of celiac disease. A large 2011 study looked at genetic differences between over 12,000 individuals with celiac compared to approximately the same number without celiac disease. This study identified quite a few polymorphisms that influence the risk of celiac disease. Look at Table 2 in the study to see the SNPs and their risk. A sibling study from 2011 found three SNPs to be significant in increasing the risk of celiac disease among siblings where one sibling had been diagnosed with celiac. The A-alleles of rs1464510, rs842647, and rs2816316 increased the risk of celiac disease in siblings in conjunction with the HLA type. See Table 2 in the study. An August 2015 meta-analysis showed that a T-allele (23andMe orientation) on rs917997 increased the risk of celiac disease by 5%, The same study showed that a T-allele on rs6441961 increased the risk of celiac by 6%. One other possible risk factor for celiac is a found in the gut microbiome. A 2015 paper in the journal, Nutrients, summed up the current research into the gut microbe connection. Another 2015 article in the American Journal of Pathology is worth reading and may hold tantalizing clues. It is exciting to see how close we are to finally understanding this disease.